People who follow the debate on current environmental issues will be familiar with the concept of biodiversity. That is the sum total of all the life forms on earth, most of which we don't yet know by name, and too many of which are disappearing as you read this. They may seem like distant insignificant beings, but they are all part of the web of life. Don't click the return button yet! There's a parallel in the razor world, a sort of "Razo-Diversity" and its in just as much decline as species of tropical plants. Think of the history of razors, and imagine the long list of brand names and models. Robert Wait's excellent book "The Safety Razor Reference Guide" contains information on over 1300 brands/ models of safety razor. Even if you have a very modest collection, it would not be difficult to have examples of a dozen or more makes, and several models of each. The Sears, Roebuck and Co. catalogue of 1900 showed 16 different models of straight razor. If your (great-)grandfather had gone into a drug store in 1920 he would have had a dozen makes of safety razor to choose from, and models galore. Gillette, Autostrop, Gem, EverReady, Wilkinson, Enders, Durham Duplex, Schick, Probak, etc. Even among Gillette's there would have been a wide variety of models: New Standard, Bostonian, Big Boy, Tuckaway, Brownie, Richwood, Traveller, etc. But if you go into a store today, how many different razor brands and models will you see? Gillette with about 2 or 3 models, Schick with about 2 or 3 models, and, well, several brands of disposibles, and maybe a no-name house brand (which just might be from American Safety Razor Co.). So what's that? Three or four brands and a dozen models of razor? 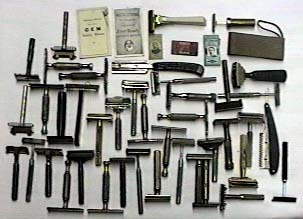 And most of these would be shaving systems with very similar fundamental designs, nothing as radically different as the four major brands of the late 1920's, Gillette double edge, AutoStrop single edge self stropping, Schick (Magazine Repeating) narrow injectible single edge and American Safety Razor reinforced back single edge. And of course, the interesting odd-balls like Collins round razors or the Durham Duplex heavy double edge. In fact, isn't that one of the things that makes safety razor collecting so much fun and so interesting, the sheer variety of ideas and systems, successful or not in the market place? And for blade collectors there's just as much variety and interest. Now, that's not to say there is no innovation going on today. Take a look at some of the modern razor types being produced around the world in our Links Page and you will see many new designs. Most are handles for the dominant blade (cartridge) systems like the Trac II and Sensor, but small scale innovation still seems to be alive in that area at least. And think of electric shavers, which are still offering several fundamentally different systems of blades and heads among brands. The question then is: Why don't we see this variety in the safety razor marketplace? Is the Mach 3 really that good? Are we all sheep waiting to be clipped with the same old shears? There are more brands of automobiles than there are brands of razors today. Wrigley makes more kinds of gum than Gillette does razors. And it hasn't always been this way. Are we doomed to be limited to a choice of one or two slightly different razors (in a wider choice of colors)? Is that all choice is in the modern marketplace: 24 flavors of ice cream, 12 flavors of coffee, and six colors of razors? The other question is: Why is this happening? Isn't this the time of the unfolding global marketplace? There was a news article published about two years ago that said the number of different products available in the global marketplace now exceeds the number of species of life on earth. Does that mean razors are doomed to extinction, a dying species that is losing its economic/ evolutionary vigor? Or does it just mean that wider and wider control of our economy by fewer and fewer large multi-national conglomerates leads to a lack of innovation, choice and quality? The jury is still out on this one. But for the sake of razor collectors of the future, I hope the declining state of razo-diversity is not a precursor of things to come. We may go extinct!